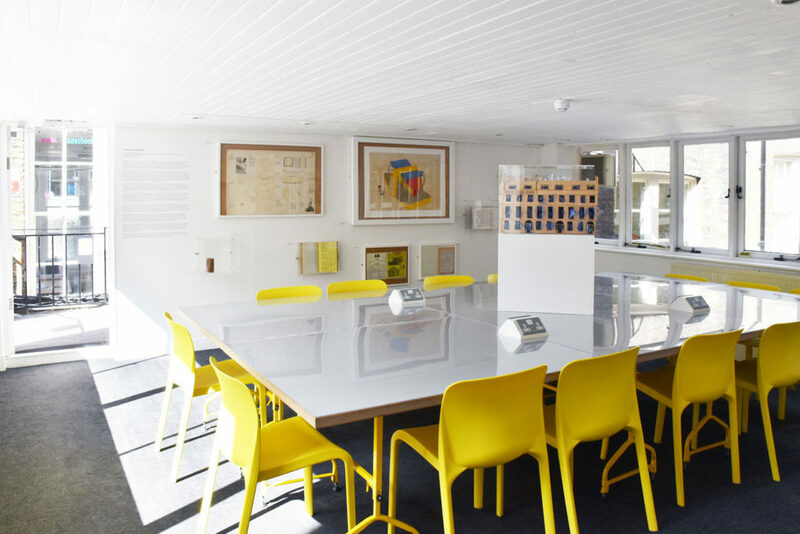 Until the 25th May, the AA Back Members’ Room will house an AA Collections exhibition curated by inaugural AArchitect in Residence, Stefan Popa (AA PhD candidate). 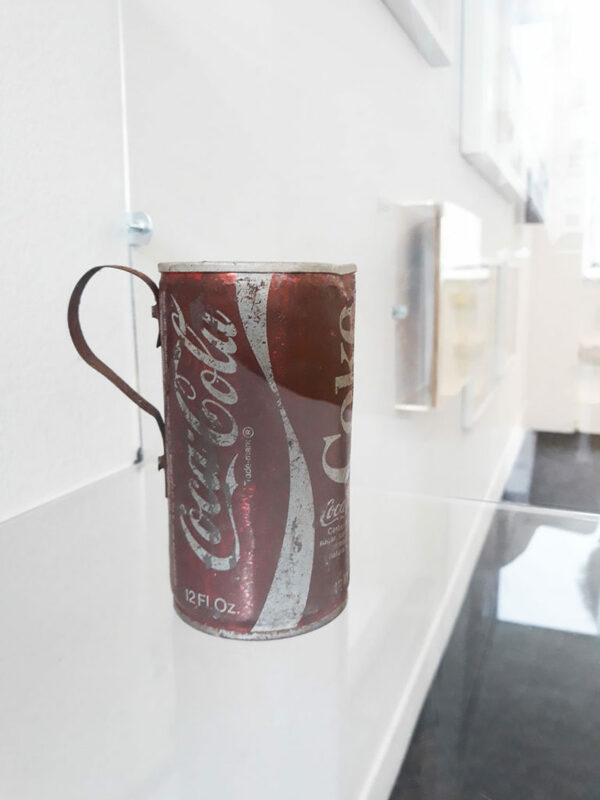 Entitled ‘[Re-] Use: ‘Ethic or Aesthetic?’,’ the installation explores the AA’s own collections as a starting point to reveal ways in which the re-use of plastic, metal and glass containers for mass-consumption products was translated into an architectural problem in the 1960s and 1970s. Throughout the 1960s and 1970s concerns around the issue of reuse and recycling of materials were repeatedly raised among architects. For instance, the Minimum Cost Housing Group created at McGill University in Montreal headed by Alvaro Ortega and later Witold Rybczynsky enhanced a dialogue between resource exploitation and use within the architectural profession. They experimented with new as well as reused materials in an attempt to balance the housing crisis caused by the uneven distribution of resources around the world. 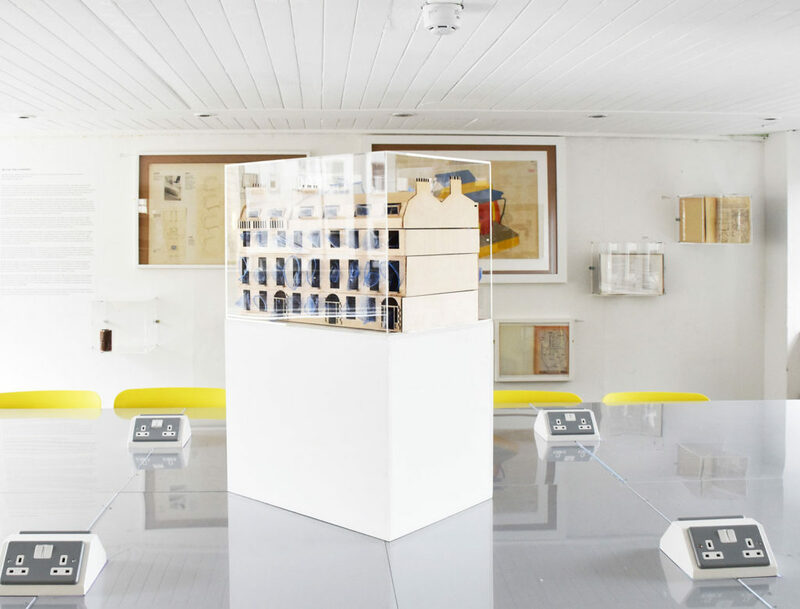 Within this context, in London, the Architectural Association was an important agent in the production of literature, critique and projects dealing with the concerns raised in this exhibition such as use, reuse, management and consumption of materials. The work of Martin Pawley (1938-2008), a former student, editor and tutor at the AA, voices the international ecological concerns and seeks an architectural solution to the issues associated with what can be called the sustainability crisis. His activity is set against a background filled with debate, sharp criticism and changes at the AA as can be seen in the content exhibited. However, his ethical statement was counterbalanced by an aesthetic and functional approach to materials. For instance, the projects by Peter Cave such as ‘Plug Hole’ (1967/8) and his study on ‘Inflatables’ (1969/70), as well as the project for an ‘Unfolding Caravan’ by John Frazer and Peter Columb (1968/69) can be understood as experiments with properties such as lightness, flexibility and durability of plastic, ignoring any concern with the life of the material after the object it shapes becomes obsolete. The dual approach to this commonly used substance exhibited in the work of students and tutors at the AA in the 1960s and 1970s is emblematic for a global problematic of use and reuse of materials. Architecture can be seen as an important platform for discussion and action regarding the extraction and consumption of resources. The profession is predominantly concerned with exploring the aesthetic potential of materials which often comes in contradiction with ethical considerations of obsolescence. Following the lecture on the architectural response to the issue of waste management nurtured at the AA during the same period, PhD candidate Stefan Popa, receiver of the first edition of the AArchitect in Residencescholarship, proposes the exhibition titled: ‘Use and Reuse: ‘Ethic or Aesthetic?’. The objects, drawings and texts on display borrowed from the AA Archive, AA library and AA Photo library are framed, supported or secured within reclaimed wooden and metal frames as well as methacrylate boxes. The selection aims to comment on the margin of the context in which the question regarding the reuse of plastics, metal and glass containers for mass-consumption products was translated into an architectural problem in the second half of the 20th Century. What is of interest in this room is the triggering of a discussion on the use of materials in design, architecture and construction within the boundaries of the category of ‘the ethic’, rather than ‘the aesthetic’. Ethic inasmuch design practices have to be a conscious act by which materials are used in awareness of all their stages from extraction to waste. The discussion can therefore begin based on the assumption that the question of materials in architecture, including (and especially) plastics should relate to the field of environmental ecology before it can be considered a question of stylistic label (Arthur Quarmby invents the term ‘the plastic architect’ as can be seen in exhibit ?). Thus, the exhibition aligns itself with the contemporary inquiry into an architectural response to issues related to recycling and reuse of materials. It aims to stress the importance of the role of architecture in dealing with the increased amount of waste resulted from fabrication processes. Moreover, this platform attempts to clarify the ways in which the practice of architecture is involved in the current debate of plastic waste by asking a simple question: What is our possible agency as architects in the current quest for sustainable development, often contradicted by the accumulation of waste such as plastic in the most inappropriate environments? We may rightly ask if, at present, architecture and its professionals have a fundamental role in shaping the way we consume and manage the available and unavailable resources. It seems that the connotations of the utterance ‘Sustainable Development’ elude the agency of architecture. The root ‘arch-‘ emerges only two times in a the 300 pages of the Brundtland report (1987); Moreover, the same radical appears on no more than one occasion within the later United Nations document for sustainable development, Agenda 21 (1992). This observation fuels the interest in a detailed investigation into the apparent complete disengagement of politics of ecology and practices of architecture after the second half of the 1980s. However, in the period preceding the issuing of these documents in the late 1980s, the United Nations was enabling research and discussion into resource management optimization, housing and population growth. The aim on this occasion is to go back in time and scrutinize the contribution of the architecture discipline to ecological debates. Pawley’s work stands for a strong critical architectural voice based at the AA and projected internationally on issues of housing, materials and waste management. The present exhibition attempts to recover this voice in the hope that it would contribute to the debate around the future of the architectural profession. 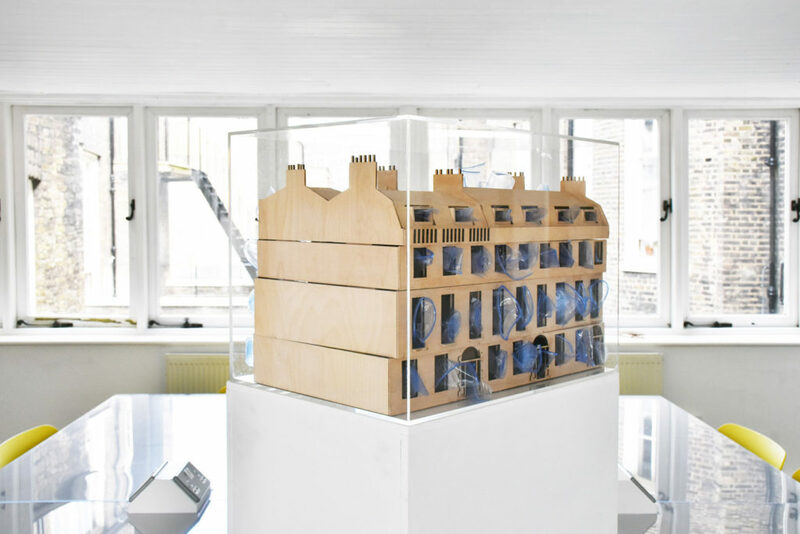 The exhibition is part of the first edition of the ‘AArchitect in Residence’ annual series at the Architectural Association. All images courtesy of Byron Blakeley.